Planning to go on a vacation or just a trip to town to do some buying? Looking for a conveyance which is comfortable as well as affordable? Contact us anytime as we are available 24/7/365 and with the help of our staff book transportation for your family, team mates or group. Apart from our 8 seater XL, we also give services to a group of about 12 people. We have well maintained minibuses to offer for parties like these. The very classy and comfy Ford Transit minibuses are used for these purposes whose reliability is unmatchable. It not only offers comfort but also gives privacy because of its tinted windows so that you can enjoy your journey in Bolton and beyond. While the staff performs regular maintenance check on these minibuses, the scheduled maintenance is done by the vehicle manufacturer. This vehicle can accommodate group members and their luggage easily with a lot more free space still left. 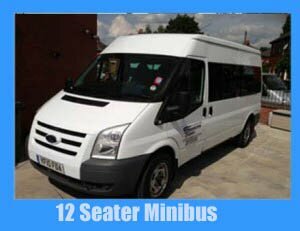 For groups of 9 or 10 people who do not want to pay extra for a 12 seater, we have a much similar Ford Transit for them which guarantees same clean, comfortable and steadfast journey but with fewer seats. We feel proud to be at your service when you are planning your vacation or day out in Bolton or out of it. Our 12 seater minibus is not only affordable but is competitive as well. It is a popular choice among people because of its capacity and comfort. We recommend that you contact us a few days before you plan to leave to make arrangements. Our online quote form is available or you can feel free to contact us by call, email or simply make a visit. For us, the convenience of our customers is everything that is why we have priced our services reasonably and do everything we can for your satisfaction. We are at our services all the time so feel free to contact us any time to plan out your trip with group or family. Our friendly and experienced staff will assist you and will provide you with safe, clean and comfortable means of transport. So, traveling around Bolton or beyond with Minibus hire Bolton. People who are looking for a tad but more than the regular 8 seater experience, an 8 seater XL is up for rent for them. They are very spacious and provide excess space to hold your luggage and trip supplied to be carried around the city, or to from the airport. It is similar in vehicle quality to the traditional 8 seater and makes sure your group has reached its target safely. Our 8 seaters are branded as our most rented vehicle. They are available at prices which are affordable and competitive at the same time. This makes them a popular choice with the customers. Considering the demand of these 8 seaters, it is suggested that you book your vehicle before time. You can contact us through phone or email, or for a more personal experience, visit us at our office. We will help you in making plans that not only suit your schedule, but also don’t take a heavy toll on your pocket. If you wish to see a quote before planning out your entire trip then feel free to fill out the online quote form that is available on our website.